All about Jobs, 2: Should the Unemployment Rate Actually Be Lower? There are now just 0.91 unemployed people per opening, compared to 1.12 in January 2001. 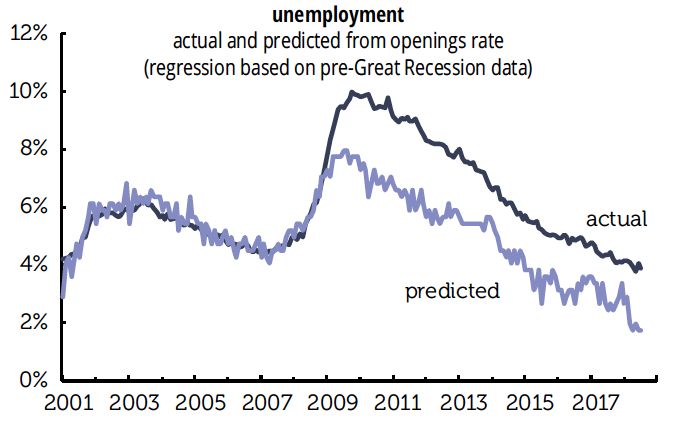 Or, as the graph below shows if the relationship between the openings rate and unemployment rate that prevailed before the Great Recession were still in place, the unemployment rate “should” be well under 2%, less than half its current rate.